The Mignon is the mother of all index typewriters. It appeared on the market very late, in 1905, but remained very popular until the final production year in 1934. And even then the concept was copied by the TipTip company that continued to produce a similar machine for some years. The principle of the Mignon is very simple. It combines a typesleeve with a complete character set, and an index card with pointer and two (later three) keys. Point the pointer at a letter on the index and strike the key to print a letter on the paper and advance the carriage. With minor practice the operator could reach a typing speed of at least 100 strokes per minute. Both the index card and typesleeve could be replaced to change fonts and use character sets for different languages. 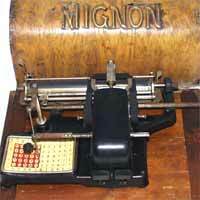 The Mignon combined the simplicity of more primitive index machines with the sturdiness of a well-produced office machine. It was in fact a real alternative for much more expensive keyboard machines in the offices of the early 20th Century. And because of the interchangeable typesleeves, the machine was a highly practical tool for jobs that required the use of different fonts. It's only competitor for this work was the much more expensive Hammond typewriter. 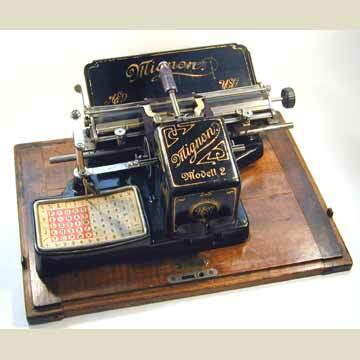 The first Mignon model to be produced and sold in considerable numbers was the Mignon 2, that was built until 1913. Only one specimen of the Mignon 1 is known to exist in a museum in Leipzig, Germany. The Mignon appeared on the market in different countries with different names and different colors. The second picture shows an extremely rare variation with embossed, nickel-plated paper table that was sold in France. Around 1913, just before AEG introduced the Mignon 3, the company produced a transition model, with a metal cover over the mechanism, much like the one on the Mignon 3. About 3,000 of these wered built but only a handful are known to exist today, with serial numbers betweem 44.000 and 47.000. Also see Mignon 2 Red and Mignon 4.